Here's one for you- A delicious pasta recipe that makes us say "Mmmmmm!" every time. 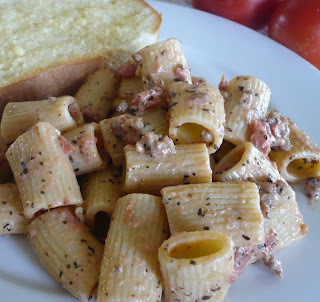 It is so easy to prepare and different from your every day pasta. The original recipe does not call for the sausage, but we love this dish even more since adding it. Enjoy! Brown sausage in pan. Set aside and keep warm. In a saucepan, saute onion and garlic in olive oil over medium heat. Make sure it doesn't burn. Add tomatoes, basil, sugar, oregano, salt and pepper. Bring to boil and continue to boil 5 minutes or until most of the liquid evaporates. Remove from heat; stir in whipping cream and butter. Add browned sausage. Reduce heat and simmer 5 more minutes. Toss with prepared pasta. *I usually use regular whipping cream and omit the onions for my onion hating husband. The results are still fantastic! Looks yummy. I'll have to try it!